Have you ever noticed that sometimes thinking about a stressful conversation makes you want to reach for a calorie rich snack? Often you probably don't even notice the connection between your feelings of stress and your desire for junk food. Many people struggle with emotional eating. We sometimes tell ourselves that a little treat can make us feel better. Maybe we even reward our family members with sweets to cheer them up. A little indulgence is good for everyone, we believe. But if we do it too often we may unconsciously end up with long-term pattern of eating unhealthy foods to lift our moods or numb out a little. What can we do to change these habits? I came across a couple of interesting bits of information which I thought might be helpful to others. Dopamine is the "feel good" hormone produced by the brain when we experience positive emotions. 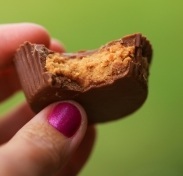 The more positive moods we have, the less likely we are to resort to emotional eating. It turns out that overeating high-calorie foods is one of the things that leads to greater dopamine production! Positive things that cause our brains to produce dopamine are positive social interaction and emotional fulfillment. So, if we can create positive feelings regularly, we may be less likely to crave high-calorie foods. Brendan Brazier, author of "Thrive: The Vegan Nutrition Guide to Optimal Performance in Sports and Life," shared an interesting discovery about willpower. He says we usually think of will power as something we either have or do not have. But studies show that will power can be increased, or maybe recharged is a better word. He talked about a study which showed that a group of students who were given a stressful task and then asked to resist sugary snacks showed significantly less will power than another group of students who were assigned a pleasant relaxing task and given the same sugary snack temptations. The ones who had been in the stressful situation had very little will power to resist temptation. The ones who had just finished a pleasurable outing had very little difficulty resisting. What do you think about this? Have you observed the same pattern in your life? Juliet, thank you for sharing of this information. I think this tips really useful to me. Next time I think I will have some low calorie ice cream cups when I in stressful.